Teacher Appreciation Day is May 7. I started thinking about this last week and in the midst of trying to figure out what am I going to give this time....I remembered seeing a form that I could give the teachers to figure out what it is that they like. So, I went to pintrest and looked up Teacher Appreciation. I am a big believer in giving gifts that people would actually use because I personally am not a collector of things that do not have a purpose or use by me or by a family member. Hence, I do not like to give party favors that are going to be a waste for someone to take home and never be used. There are quite a few forms online that you can print out and give to your teacher, but this is the one that I liked and used. 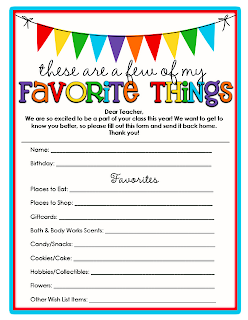 When you click on the above picture, you will also find some teacher appreciation gift ideas as well as a link to download this form. I do have a few teacher friends and I do know that they personally don't like getting gifts that just keep collecting around the house and really don't have any use or purpose. Even if you can not afford to give an extravagant gift, they have such cute ideas out there that you can do. You can bring them a cup of their favorite coffee, a bag of their favorite candy, or even just a homemade card from your child to the teacher. It's the thought that counts the most. I haven't decided what I am going to give them just yet, but once I do I will post it. Good Luck with your Teacher Appreciation gifts this year.